A White Hall gig is the traditional style of New York Harbor 19th century working and racing row boat. 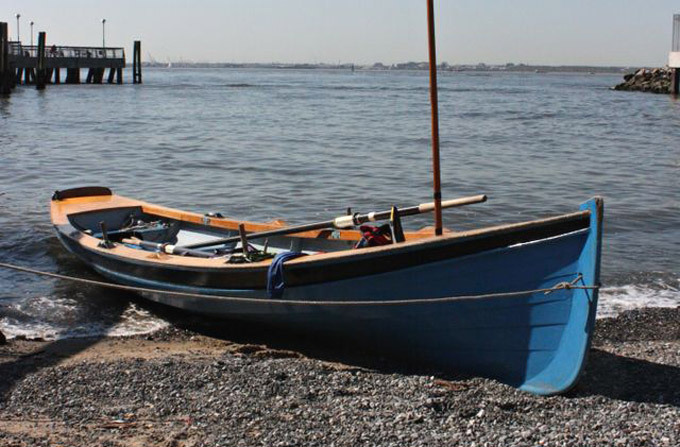 It is used by East River C.R.E.W., as well as other rowing groups. Designed and coded by students (especially Kirill Shevyakov) in the advanced web design course at the Borough of Manhattan Community College and their incredibly talented professor Revital Kaisar. 2016 Rowing has begun. Meet us on Tuesdays at 4:30pm at our boat container on the southbound FDR service road between 95th and 96th Streets or at the boat departure point at 96th Street and the Esplanade at 5pm. We provide a life jacket and guidance as you provide your signature to our rowing waiver form. EAST RIVER C.R.E.W., EMAIL: tgilbert@eastrivercrew.org, PHONE: (212)-427-3956. All rights reserved.